Today is the opening of the summer blockbuster film Eclipse, the third film of the Twilight saga. Bella is graduating from high school and feels pressured to make a choice between Edward and Jacob. Should your choices be defined by or limited to your relationships? Start Strong Idaho asks this question in its Facebook campaign and last night hosted a “Campaign for the Third Choice” event (with music, fun Eclipse events and prizes) in Boise, Idaho. As we discussed in the PreventConnect podcast Building healthy teen, vampire, and werewolf relationships, Start Strong Idaho is using the popular Twilight movies to promote prevention of teen dating violence. Start Strong Idaho: Building Healthy Teen Relationships is an initiative in southwest Idaho to promote healthy teen relationships and prevent teen dating violence by helping 11- to 14-year-olds develop healthy and safe relationship knowledge and skills. It is part of the Start Strong Initiative, a national program funded by the Robert Wood Johnson Foundation. What a smart idea to take a movie that’s so popular with teens to engage with them about dating violence! I thought the first interview you did with Start Strong Idaho was really interesting — hope to see another interview about some of the learnings from this campaign. Last night, hundreds of Idaho teens rallied at the premiere of Eclipse for the Start Strong Idaho Campaign for the Third Choice. The Eclipse event was held at the largest showing in Idaho of Eclipse – the Idaho Eclipse epicenter -for over 2,000 fans in partnerhship with local popular radio station KISS FM 103. 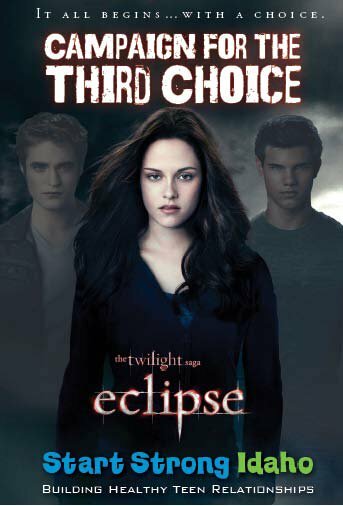 Start Strong Idaho promoted the third choice to Twilight teen fans – not Jacob, not Edward, but themselves and talked with Twi-fans about the importance of not being pressured to make a choice in a relationship. Over 500 Eclipse fans participated in six healthy relationship activity booths to earn a Campaign for the Third Choice t-shirt. Local television media was out in force. Own your deicisions – join the Start Strong Idaho campaign on Facebook Eclipse: Campaign for Third Choice! Start Strong Idaho teens have an answer to the Edward vs. Jacob question for Supreme Court nominee Elena Kagan – she should choose herself. This could have been a great teachable moment for young people around the country – , every choice you make defines you. And in a healthy relationship, no one should be pressured to make a choice. The Campaign for the Third Choice encourages teens to own their choice. Define themselves. And imagine their future – and maybe even without a wolf boy or vampire boy. Join the Start Strong Idaho Eclipse: Campaign for the Third Choice on Facebook and own your choice.